Art One Academy offers many diffrent art classes for all ages and abilities. The foundamential skills in visual arts are developed through practicing drawing techniques. 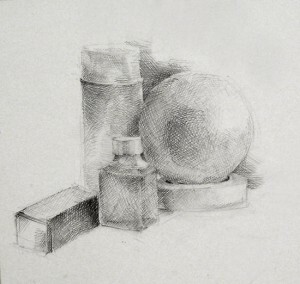 The recent project of Advanced drawing class was to study geometric shapes using crosshatching techniques. The goal here is to see how three–dimensional objects can be transferred to a two-dimensional shape and how the play of light on an object creates its visual form. 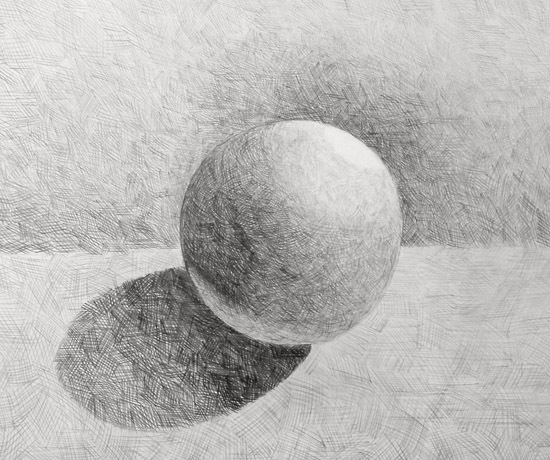 Part of learning to see – the foundation of realism in drawing – is learning to find the basic shapes inherent in every object, no matter how complex. There are four basic geometric shapes: sphere, cube, cylinder, and cone. Anyone can draw these four shapes. Ones you learn to see these four simple shapes in more complicated objects, you can draw anything. Using the basic shapes as the foundation of your drawings will allow you to achieve a realistic look. There’s a very specific process to drawing well. If you use all necessary stages in your drawing process, you’ll have control over the entire drawing, which means you’ll be able to produce a finished work that close to achieving the effect you want. 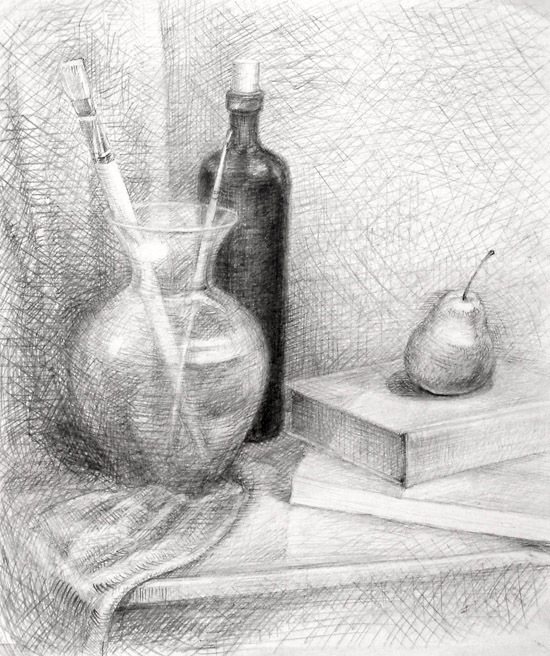 This is what we are teaching at our drawing classes and you will practice this vital skill throughout our advanced drawing course refining your ability to discern the basic shapes in any object and to accurately render the play of light and shadow on the objects you draw. Here in this post you can see some of examples of our students drawing projects as well as Alan started to draw a still life with various geometric shapes. 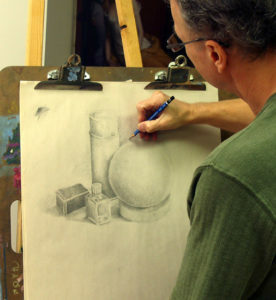 Description for our drawing classes can be found in the program section of this website.